Halliburton/Dresser VTC-e Flowmeter - Paragon Innovations, Inc.
Paragon Innovations develops VTC-e Flowmeter for Halliburton/Dresser. Halliburton benefited from the Paragon Innovations philosophy of integrated hardware and software engineering processes, low power design, complete documentation and client ownership of IP. The product achieved exceptional low power consumption. Product improvements are the key to success. The existing flowmeter was a low power device, but additional features were needed. The device was originally based on a Microchip PIC microcontroller. The features desired included screen updates, compilation changes, and increased system analysis. The goal of the design was to develop a low power system that could run for 5 years on batteries. Due to the new feature set, the processor was changed to a TI MSP430. 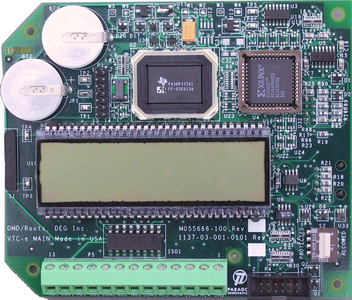 This microcontroller has advantages such as 6μsec wake-up time and more memory on-chip. At the end of development, the final device had a current draw of less then 60μA from a 5 Volt supply. Complete hardware and software documentation – including IP rights – was provided to Halliburton as a value-add. The power requirements were achieved, giving the device a long field life.